"NASA Dawn Mission encounter with Ceres will be the first time the surface (or atmosphere) of a planet will be imaged for the first time by a spacecraft since Voyager 2 flew past Neptune in 1989. Dwarf planets like Ceres and Pluto/Charon (which will be encountered this July by New Horizons) are the most common type of planet in the solar system - and may be the most common type of planet in the universe. Dawn is the first mission to orbit and study such a body in detail to see how it works and compare it to other planets such as Earth. Dawn will be captured by Ceres' gravity on March 6. We are conducting a series of navigation and rotational characterization observations, each of which will be more exciting than the last, until we commence Survey mapping orbits on June 7 at an altitude of 4900 km (and a resolution of ~0.5 km/pixel), then move down to High Altitude Mapping Orbit on August 8 from 850 km (80 m/pixel), and finally Low Altitude Mapping Orbit on December 13 from 476 km (45 m/pixel). We'll be obtaining Framing Camera imagery in different filters, spectra from a visible-near-IR mapping spectrometer, and elemental compositional information from the Gamma-Ray Neutron Spectrometer. It is going to be a fun year (or two!!)." The blog note above from Dawn nicely sums up the Ceres encounter, which is now quite literally almost on us. We are now within the orbit of our Moon if it were orbiting Ceres, and this is very close indeed. As Dawn's cameras are designed to map at much closer distances we won't be seeing a lot of detail until we get into mapping orbit but will instead slowly peel away Ceres' secrets as we move in on ion thrusters. To give a sense of what types of things we might see on Ceres at different stage of the mission, I put together some slides featuring Saturn's moon Dione, the closest 'twin' we have of Ceres. Dione is rather similar in size to Ceres (Ceres 950~km; Dione 1120~km) [see also last weeks post for comparison shot]. The similar low densities (Dione is ~1.6 times as dense as wear ice, Ceres ~2 times) indicate that both have lots of water ice. Ceres is a little bit rockier but both are believed to have an outer layer of water ice a 100 kilometers or more thick. 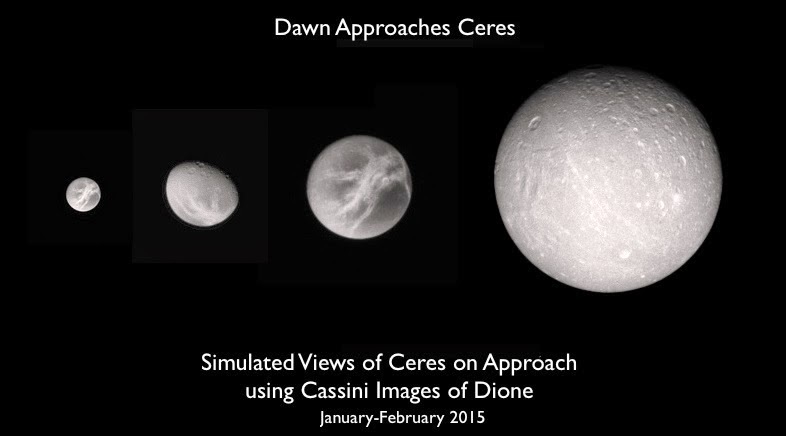 Reposted from last weeks blog: Dione as viewed by Cassini at resolutions comparable to Dawn at Ceres. The center image approximates our view of Ceres in the middle of February, the last image our view during the last week of February. But Ceres is not going to be Dione. We may be making too much of the Dione analog, but it is a starting point. First, Ceres is indeed a planetary object, and as noted above the first time we have explored such a body unresolved before since Voyager in 1989 (and Pluto is next). Instead, Dione orbits Saturn and has been subject to its influence and that of it's neighboring moons. I refer to the gravitational tides that power the jets of Enceladus and likely resurfaced much of Dione's leading hemisphere with smooth plains and flattened some of its impact craters (more on that later, and I discussed some of these aspects in the previous post). Second, Ceres is much closer to the Sun, which both warms the surface and interior, and makes the ice unstable over long periods. This later effect, sublimation, can be seen in the northern states during winter as snow both melts and evaporates. This is an erosive process that can seriously (or Ceriously?) degrade a landscape, as we saw on Callisto in Galileo images. Callisto is of note because it too is icy on the inside but like Ceres is very dark reflecting only 10% of the Sun's light, contaminated by hydrated silicates and carbon-rich gunk. (Callisto's global albedo is higher but I refer here to the dark stuff only.) This similarity might be important. So, here are some slides showing Dione and Callisto at different resolutions comparable to those expected during the Ceres approach phase. Parts of Ceres may look like this but probably not. The images should give us a sense of what types of features will be detectable as we move in, however. Views of Dione from Cassini at increasing resolution. Views show the types of features that are likely to be resolvable as we map Ceres in 2015, including impact craters and fracture networks. Views of Callisto from Galileo at increasing resolution. Views show the types of features that are likely to be resolvable as we map Ceres in 2015, except for a dark icy object undergoing sublimation erosion. The bottoms view is of one of the ring scarps surrounding the giant impact Valhalla. Now that the encounter phases of both the Dawn and New Horizons missions to Ceres and Pluto, respectively, have officially begun, and before we actually resolve any geologic features (which for Ceres may be a matter of just days away), I thought I'd venture into more hazardous territory and look ahead to what we might find, focusing this week on Ceres. I have been asked several times what we expect (predict?) to see on these small icy worlds orbiting the Sun, but each time I found my self stumped for a credible answer. We have global maps for most of the icy moons (namely the 17 or so large enough one considered true worlds and not just battered limps; and I've helped produce a few of those as shown in earlier posts . . . ) We have catalogs of surface features and have evidence for almost every major geologic process occurring on at least one of these objects. So we know what craters, volcanoes, faults, and landslides look like on icy bodies. What we do't know is in what combination they will occur on either Ceres or Pluto. Will Pluto and Ceres surprise us with new features and rewrite what we know about ice worlds? It's very possible, of course. Both are unique even among ice worlds, Ceres being unusually close to the Sun, and Pluto a large icy world orbiting the Sun at great distance and with 5 known moons of its own. Several "space" artists are also trying their hand at the predictive arts. 'streincorp' has a rendering of Ceres on Deviant Art that looks rather like Mars in some ways, without the canyons and river valleys. Michael Carroll has another interesting view that tries to incorporate the HST and Keck observations, showing arcuate structures and the impact craters likely extending over most of the surface. Speculation has also focused on whether or not Ceres and Pluto have been warm and active or cold and moribund. Probably somewhere in between. It would probably be a surprise if Pluto's geology was as extremely young (features formed in less than 100 million years) as Triton's. Pluto may have had a violent beginning, having given birth to its system of moons in a violent Charon-forming collision long ago. Triton on the other hand was completely remade in the violent events associated with being captured by Neptune. Orbital tides and perhaps collisions with Neptune's original moons essentially melted Triton from the inside, resulting int he extremely contorted young surface we see today. So, rather than speculate on what Ceres and Pluto look like, perhaps it would be more fruitful to consider what it would mean if we see different sorts of things on those bodies. It is generally assumed that geologic activity on a planetary body implies there are higher levels of internal heat. Probably the most compelling discovery would be volcanism (as in melting and eruption onto the surface of ice phases, including water, methane, nitrogen, and various similar compounds). This would be direct evidence for very warm temperatures on the insides of these bodies. Heat on either Ceres or Pluto is not likely to come from tidal focus as it does on Europa or Miranda or Triton to name a few. We will look for a variety of features, among them volcanoes, which would indicate temperatures hot enough omelet and mobilize water and other ices. The extent and duration of any such volcanic terrains will tell us much about Ceres thermal history. Diapirism, which is another name for convection in the solid-state, without large-scale melting, would also probably require considerable heat. Diapirism is the rising of one layer upward into another, usually in the form of large blobs (quite a technical term, I know!). Salt domes are perhaps the most common examples here on Earth. The cantaloupe terrain on Triton is probably a vast diapir field (and one my early findings back in 1993). The oval domes on Europa may be another example, and the coronae of Miranda may be diapers of upwelling ice on a planetary scale. Several colleagues have suggested that convection could have occurred within Ceres and might be visible on the surface. A simple density contrast within the crust, of a dense layer formed over a less dense layer could also trigger overturn. It turns out hat the scale of such features tells us something about the heat levels and the thickness of the layers, so that if we see this on Ceres it will generate a lot of interest. Diapiric convection occurs at different scales. 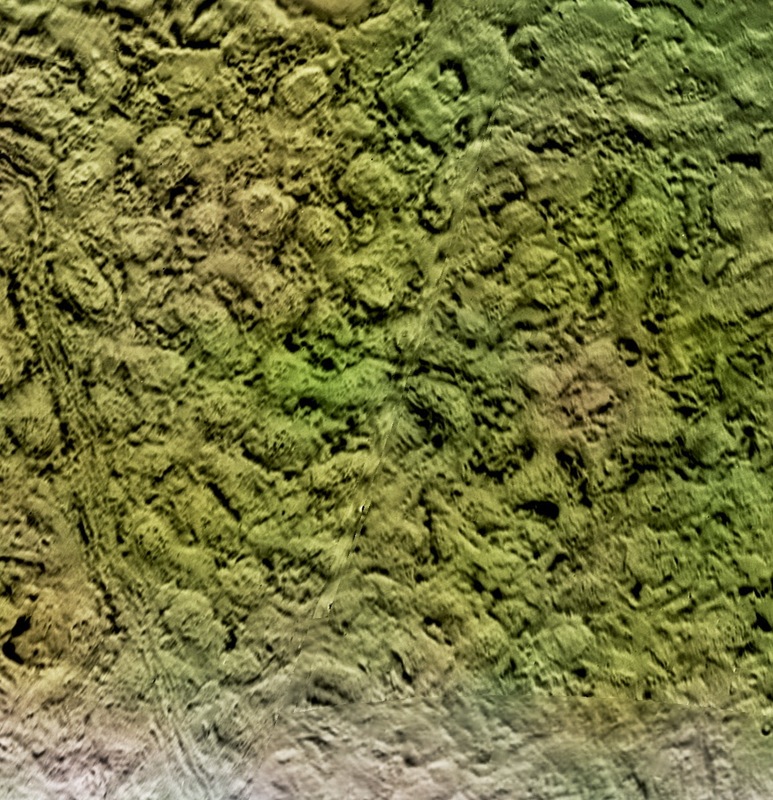 Examples include Triton's cantaloupe terrain, shown above at 350 meters (or Survey orbit) resolution. The oval cells are 30 to 40 kilometers across, each representing an upwelling dome of ice. We will also be looking closely at impact craters. That is my specialty, but we will look at that more closely in a later post. The key thing is that impact craters form predictable features. Any alteration totem tells us about how hot the planet got or how eroded it became. Measurements of crater shapes will be key to unraveling these questions, depending on what we find. Ceres will be revealed in stages, with major structures coming into focus first. Large rifts and fractures, the major basins and deep craters will be resolved, in part because of the shadows they cast, giving us an early indication of what type of planetary body we are going to map. Circles and lines stand out. Small features like crater chains, narrow fractures, (large) boulders, cliffs, landslides and other erosional processes, will become increasingly apparent as Dawn descends to tighter orbits. Vesta was revealed in the same way. Vesta is a fascinating object, but shares many familiar qualities with rocky objects like the Moon. Ceres will be no less fun, in large part because it is so different from anything we have looked at before: a lone icy object orbiting the Sun. An attempt to show how Ceres might look in our night sky if it were at the Moon's orbital distance. 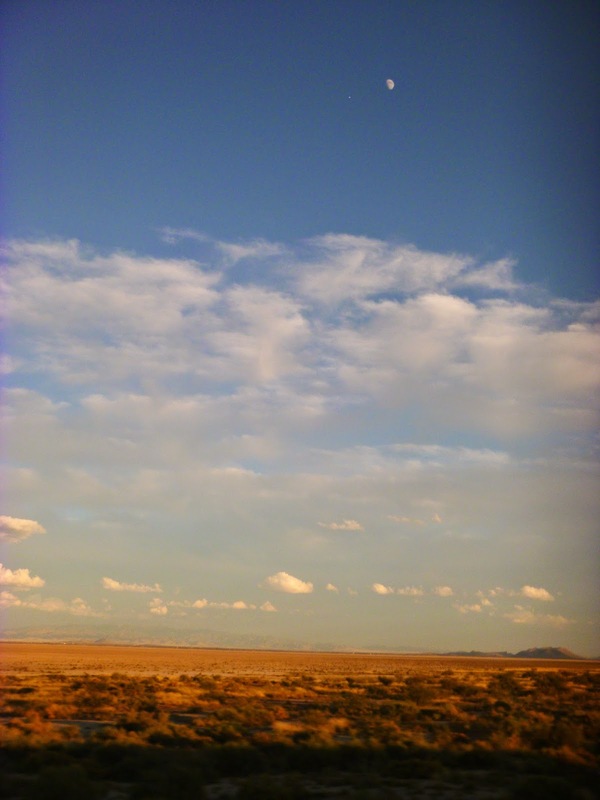 Its a simplistic rendering using a digital photo at dusk over New Mexico two years ago. Ceres is the small disk just left of the Moon.